A slip and fall brain injury in Maryland – How to get justice? If you suffered a slip-and-fall brain injury in Maryland, you might need a lawyer to recover some compensation. Any slip-and-fall injury should be preventable, and if a party did not take proper care in preventing it, they could be found responsible. For example, if your fall occurred at on business or commercial premises, you may receive full compensation. In this article, you will learn how to get justice if you suffered a traumatic brain injury from a slip-and-fall accident. According to the slip-and-fall law of MD, the first thing that needs to be determined is if a person can be held liable for your slip-and-fall brain injury in Maryland. Most of the time, the responsible party is the owner of the premises, but in some commercial situations, the business tenant has a greater responsibility. For this stage, it is crucial to get the help of a slip-and-fall injury lawyer from Maryland that knows the slip-and-fall law of MD and how to back up your claim. A business owner might not be liable for natural accumulation of slippery substances, like snow or ice, the first time this occurs. But if the proprietor allows for the slippery substances to remain longer than reasonable, then they may be held responsible. This is also the case with the rain gutters. 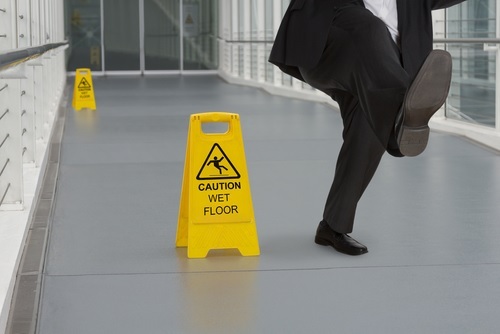 If your traumatic brain injury is the result of a slip-and-fall accident that took place on the ice from the runoff of the rain gutter, you can make the owner of the business pay you a slip-and-fall compensation in Maryland. This is also true for leaky floors in the supermarket. The less conspicuous the slippery substance is, the greater is the responsibility for the owner to assure the accident does not happen. What about motor vehicle accidents? With motor vehicle accident, it is best to get the evidence evaluated by a slip-and-fall personal injury attorney from Annapolis. This way you have greater chances of proving the business owner’s fault. It is crucial to preserve all the evidence in the actual conditions from the time of the fall. You can use a cell phone to take pictures of the spot of the slip-and-fall accident and the conditions. Today’s cell phone cameras offer the possibility of taking quality pictures and can even help prove what the slippery substance was. You should also keep the shoes you were wearing when the accident took place to see how slippery they are. A slip-and-fall injury lawyer from Maryland can help you gather and test all the relevant evidence you need to receive a slip-and-fall injury compensation in Maryland. Contact the leading slip-and-fall personal injury attorney from Annapolis at (443) 569-3950 or send us an email at [email protected] for a free consultation of your case. Head and brain injuries are extremely dangerous and could cause significant disabilities. That is why you should bring the responsible person to justice.